Everyone wants to know what homeschool grammar program to use and how to teach grammar with the least amount of stress. Some end up getting burned out trying to teach grammar and others seem to have children that naturally “get it” without much instruction. What does it take to teach homeschool grammar? If you teach grammar in the elementary years, you shouldn’t have to teach it after that. If they don’t get it by then, you have some problems on your hands. Read to your children and let them read as much as possible. Reading and hearing great literature will help your children develop good grammar skills better than anything else. After hearing you read and reading themselves, they will be able to tell if a sentence sounds right or not. Filling out workbook pages each day for 6 years is not the best way to teach your children how to read and write. Speak correctly, use fun methods like Mad Libs, wait until later in the elementary years to reinforce what nouns, verbs, adverbs, etc are and your children will have a good base to build on to know the proper sentence structures. Remember, you don’t have to teach all this to them in one year! Just keep teaching a little at a time and keep building on what you taught them and they will have a good handle on grammar. Whether you use First Language Lessons (my absolute favorite! ),Winston Grammar, Easy Grammar or some other homeschool grammar program, just keep at it and you will see results. Mad Libs help children keep up on knowing their parts of speech in a fun way. Free Online Grammar and Writing Handbook – This is the best resource I found and it’s free! You just have to print it off. http://www.sfreading.com/resources/ghb.html They have books available for grades 1-6. 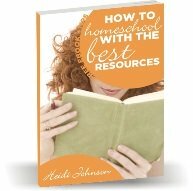 More Internet resources for homeschooling for all subjects. Do you need an expensive grammar curriculum? Maybe and maybe not – it just depends on your teaching style and your child’s learning style. Whatever you do, make sure you choose the resources for your child and not try to fit your child into a curriculum that you decided to purchase.